The traditional climbing boards are just like rock, or as close as they can make it, they come in a variety of colors, sizes and manufactures. Metolius, is going a little more green with these natural wood training boards. These are stylish enough to put up in your house. This is pretty good, slow down and the play list slows down as well, speed up, well you guessed it faster beat. This would work well with one of my ideas InSendtive. Get ready to rock your run! Part coach and part dance partner, Cruise Control produces magical running experiences. It adjusts your music in real-time to control your running and keep you on track to hit your target pace, heart rate, or cadence. We call it Cruise Control because it works a lot like cruise control in your car - you set your target, and the music will keep adjusting its rhythm, just like the car adjusts its throttle, to get you to your target and keep you there. But Cruise Control is way more fun than pushing a button in your car! Imagine flying down the trail at exactly the speed you want, with every beat of every playlist song synchronized to your footfalls. It feels like your favorite band is right there with you, timing their kick drum to drive you faster and further. When we use it, we always get “Cruise Control Moments” - irrepressible smiles that stretch from ear to ear, outbursts of singing, and even some high-fiving of random dog walkers. Yeah, you can look a little goofy, but it sure feels great. FREE RUN: A good place to start! Just go for a run and the rhythm of the music will adjust to match your running rhythm. Automatically. PACE: Pick a target speed and go! As long as you match your steps to the rhythm of the music, the music will get you to your target speed and keep you there. How accurately? Our lab tests show that the average pacing error is less than 1%. HEART RATE: Pick a target heart rate and go! Just like Pace Mode, as long as you match your steps to the rhythm of the music, the music will drive you to your heart rate goal. Our lab tests found that, on average, the measured heart rate is within 2 beats per minute of the target. Of course, you will need a Heart Rate Monitor for this mode. CADENCE: Special order for the 90 strides per minute junkies! Pick a target stride rate and Cruise Control will adjust all your songs to play at the same tempo. This mode is also great for showing off how our algorithms can change music tempo without changing music pitch. No Alvin, Simon and Theodore here! Cruise Control is no one-trick pony. 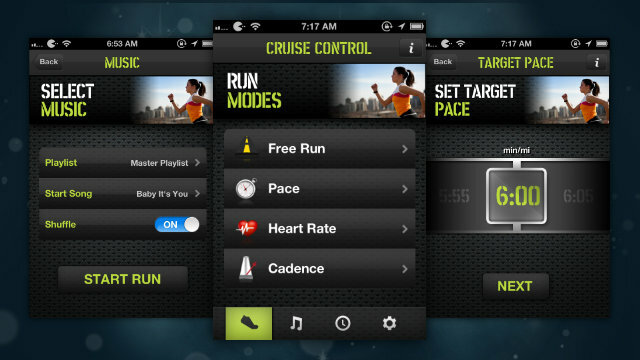 It is a full-featured running app. ✓ Listen to your music. CC pulls good running songs from the music already on your phone into the app automatically. Need more tunes? Follow us on Twitter @CruiseCtrlRun or check www.cruisecontrolrun.com for run-tested playlists. ✓ Customize your favorite songs into epic playlists. ✓ Control your music on the run by switching songs or playlists or using the thumb-up and thumb-down feature to keep track of those great and not-so-great tunes. ✓ Accurately measure running pace and cadence using the iPhone’s built-in sensors. ✓ Pair with ANT+ and Bluetooth Smart heart rate monitors and stride sensors for even more running data. Check out our favs at www.WahooFitness.com. ✓ View your pace, cadence, heart rate and route map as you run including current, average and maximum values. ✓ Review your running history. CC logs of all your runs - including mileage, distance, map, pace, cadence and heart rate – and organizes them by date in the history tab. ✓ Share your runs via Facebook, Twitter and Google+. ✓ Email your runs including all your data for uploading to your favorite training website (e.g. MapMyFitness, Runkeeper, Strava, etc.). ✓ Works seamlessly with the iPhones 4, 4S and 5. 3GS not supported. Have questions? We're here to help! (info@cruisecontrolrun.com). Now, go rock your run! @newtonrunning 2013 models are here. Newton Running, colors are bolder, same old comfort and fast running. They have added a truck load of new apparel, shorts, tops, running singlets, YOU HAVE GOT TO LOVE NEWTON! Making security affordable is important, many of us are paying services fees, monthly fees, set up fees and 90% of the time we are less than 10 miles from home. There has been those times that it has happened that you are away and your security companies calls you because the alarm is going off, that is rare. We all have smart phone, I would rather pay the local police departments or municipalities a yearly fee for them to react when the alarm goes off. Now I am not sure how many false alarms there are in each city, I am sure it is not enough to turn down the money. It seems as though there are more and more companies making Alarm systems affordable. Hey give me a load siren, iPhone viewing capabilities and remote shutdown, sensors on the doors and I believe that is enough to keep people away. iSmart Alarm Inc. was founded in Silicon Valley in 2012 on the principles of safety, beauty, and intelligence. We designed and developed the best smartphone-enabled home security and home control system. Our products are cool, simple to use, and affordable to everyone. We protect your home intelligently! To be the world leader in affordable, expandable, and innovative home technology and home security. To make your everyday life safer and more convenient. Now this is the part that I like! All devices are mobile and easy to use, no 3-year contracts and no monthly fees, customizable and expandable. So everyone that has a kid and is or has given them a phone should consider some if not all these rules. An iPad should be considered as well. f Janell Hofmann wrote these when she gave her 13 year-old son his/her iPhone. The Radar Screen displays all your devices within range.